​While an ordinary door usually serves the simple purpose of separating one room from another, an interior french door works to elegantly bridge the gap between a doorway and window. Dating back to the French Colonial area of the 18th century, french doors' mixture of glass inserts and unique door designs combine to create a brighter and more fluid entryway to the rooms in your home. Typically made in sets of two, interior french doors open in the center, lending a stylish symmetry to your home's wide doorway spaces. Interior french door sets are available in swinging and sliding varieties. Additionally, to accommodate your decorative tastes, options for glass inserts range from opaque and frosted to clear. Read on to learn more about an interior french door set for your home. Interior french doors are a beautiful way to separate the different rooms of your home while still keeping an open, spacious feeling and allowing light to more easily pass from one room to another. A typical interior french door is made using a wood frame with either clear or decorative glass inserts. 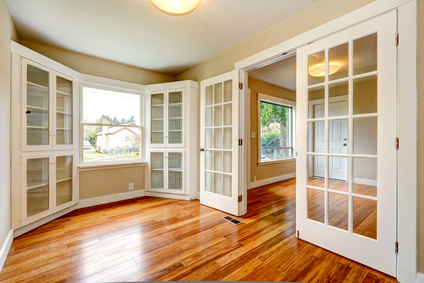 Since french doors come in pairs, they also take up double the floor space. This means that homeowners should choose areas of their home with plenty of space for their interior french door set. Interior french doors are usually built with a hinged design, which limits their usability in less open areas. However they can also be made to slide open and closed instead of swinging, similar to a pocket or barn door. This design option will save you precious floor space for furniture. Generally speaking, the unique design of french doors works well in areas of your home like living rooms, offices, or between a master bedroom and master bathroom. Since factors like warping, or other damage from the elements, aren't usually a concern with interior french doors, homeowners don't need to worry as much about durability when selecting materials. A hardwood such as mahogany or cherry will make a beautiful interior french door set. Additionally, glass inserts for an interior french door come in a variety of options, including decorative stained glass, opaque or frosted, and clear. A basic interior french door set with clear glass, made from a softwood like pine, usually begins around $400 for the pair. Interior french doors with more intricate glass panels and finished hardwoods like mahogany or cherry can cost $2,000 or more. Offering additional light and the feeling of spaciousness, an interior french door set can help your home to feel less claustrophobic. Glass options can be customized to match your needs or tastes, and homeowners can choose a swinging or sliding design. An interior french door offers a unique alternative to traditional door options for your home.